Last month, I spontaneously decided to travel around South East Asia for three months. I really have no idea why, but I am here now. So, rather than the usual collection of fascinating and witty articles on all the latest science updates, this blog is turning into my online journal to record my time travelling around Asia. Yes, as I say, I really don’t know what came over me when I decided I wanted to go travelling around the world. I think it must be partly due to jealousy arising from hearing others great stories, and a dirth of free time that was afforded me by my lack of being able to get a job. Well, I booked the flights, a few hostels, and for the most part didn’t think about what I was actually going to do, and how it would feel to be travelling alone for nearly 100 days. At the airport, these feelings finally sunk in. Here I was, waiting alone in an airport for the first time, with no parents, no friends, no teachers, no structure. Whatever I wanted to do, I could. I think this is the first time this has ever happened to me – me having absolutely no other prior commitments other than to myself. I felt strange, like I shouldnt be doing it. There must be something absolutely important that I have forgotten to do back home. Surely, there must be something stopping me from flying half way across the world. But there wasnt, I was free to do what I wanted. I was boldly going where only captain Kirk had gone before. And looking around the waiting lounge, I could see I wasn’t alone. There were dozens of solo travellers – and all looked perfectly comfortable with what they were doing. Anyway, I didnt run away. I got on the flight. There was no turning back now, and that wasnt just because i had over-inflated my neck pillow.It wasn’t particularly comfortable, mainly because the person behind me decided that their feet’s rightful position in this world was inside my chair, poking me in the back. 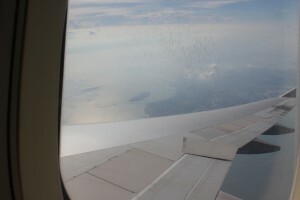 When it came to land, I looked out my window, down at Changi airport. All across the landscape were huge towers of cumulo-nimbus clouds – evidence of much warmer (maybe not wetter) climate than I was used to back home. Sure enough, as I disembarked from my plane, the heat socked me one right in the face. I was wearing three layers at the time, having come from wintery England, and didnt have any opportunity to remove my superfluous layers with dignity. Thus, I had to suffer in silence till I got to my hostel – 30 mins subway ride away. On the way to my hostel I met up with two very lovely people I had been talking to on travel forums the previous weeks. The pair were different in almost every respect. The girl was a short, talkative, local Singaporean who lived with her parents on the outskirts of the city. The guy was tall and quite shy, a Dutch traveller, part way round his non-stop circumnavigation of the globe. Together they gave me a perfect introduction to the world of travelling. He with tip and advice for my future travels, she with her encyclopaedic knowledge of the place I was starting my voyage. 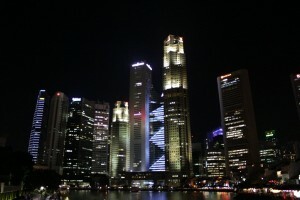 I arrived in Singapore in the early evening, which gave the three of us the chance to explore the city at night. It certainly made an incredible introduction for me – the giant skyscrapers lit up in electric lights, the traditional boats crawling down the river lit by old gas lamps, thousands of people everywhere, and thousands of restaurants and shops open late into the night to satisfy their collective appetites. My own apetite was satiated by an eclectic mix of foodstuffs – fillets of stingray, sweet potato leaves, soy pudding, starfruit juice and watermelon ice cream. The amount of culinary choice on offer in the city seems to stem from its history of accepting almost limitless amounsts of ethnic groups. Back when the city was founded by Sir Stamford Raffles in 1819, the city had Chinese, Indiann and Muslim quarters. They still survive to this day, but have been blurred and diluted by the influx of others. Now everything from Australian fish and chips to sharks fin soup is on offer, both of which are repugnant in my eyes. Anyway, that was the end of my first day in Singapore. Sorry about the lack of photos. I will add more as soon as I have the computing power available.